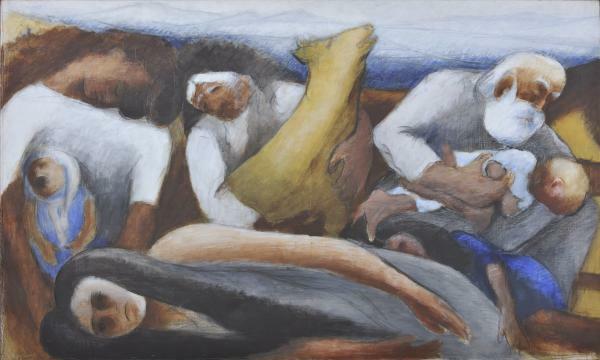 The anti-colonial struggle between 1955 and 1959, followed by the inter-communal riots of 1963-1964 and the Turkish invasion of the island in 1974 marked the beginning of the artist’s anxiety over the future of his homeland which he expressed through a series of works entitled Agonies, painted between 1963 and 1977. Agonies Before and After is the final piece in the series and it explores the anxieties of the Cypriot people in the period preceding and subsequent to the Turkish invasion. We see women threatened, trying to escape, and save what is most precious to them: their children but also their animals with which the rural communities of Cyprus had a life-long relationship. Diamantis created a different style for this new reality, one that would allow him to convey the emotions and the soul of a people and a world that had lost its sense of inner balance; it was characterised by an Expressionistic and Symbolist approach. He studied in London at the Saint Martin’s School of Art (1920-1921) and the Royal College of Art (1921-1923). Upon graduation, he split the First Prize for Drawing with his fellow student Henry Moore. He taught art at the Pancyprian Gymnasium (1926-1962) in Nicosia. He spearheaded the creation of the Cyprus Folk Art Museum and was its first director (1950-1994). He developed his own style through the study and unrestricted use of different artistic idioms. He especially studied classical values and delved into the work of El Greco, Cézanne and other Modernist artists. At the same time, he kept alive the artistic tradition of his homeland, by inseminating his works with the forms of ancient and Byzantine art. He drew his subjects from the landscape and the human element of Cyprus, which he did not try to describe but to interpret. His painting focuses on the formal, the universal and the monumental. Between 1967 and 1972 he painted the monumental work The World of Cyprus (1.75 x 17.5 m) and from 1963 to 1977 a series of eight works under the general title Agonies. He showed his work in solo exhibitions in Nicosia (1957, 1975, 1977, 1989), Athens (1962, 1976, 1989) and London (1964, 1979), as well as in group exhibitions in Cyprus and abroad. He received the Award of the Academy of Athens (1976) and the Excellence Award in Letters, Arts and Sciences of the Republic of Cyprus (1993).